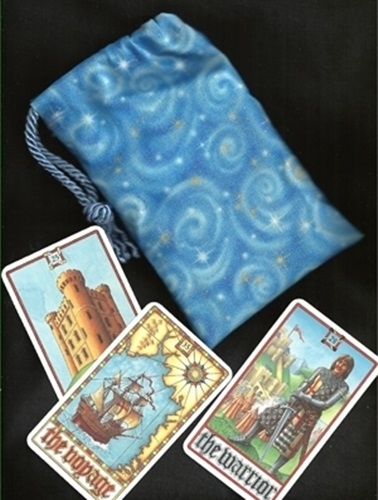 Small Tarot Bags - White Magick Small Tarot Bag - Tarot Bags, Tarot Cards, Cloths, & More! 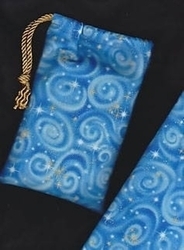 On this azure blue fabric, wand-created white spirals seem to be creating a magickal spell. Gold and white stars mark touch points of the wand on the surface. Here is a bag that would coordinate with almost any oracle or tarot deck. As you can see in the photo, it looks especially nice with the Psy Cards, an oracle system of symbolically illustrated card drawn by Maggie Kneen. 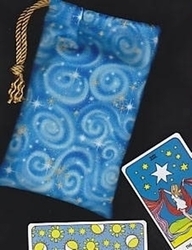 Details: One small sized tarot bag (approx. 4.5 x 6.75 in.). It will hold an oracle deck of 60 cards or less in the 3.75 x 4.5 size range or a tarot deck of 78 cards that is smaller than average and called "pocket" size.